In her latest post on her blog Julia Gorin write an article to American Legion Magazine, the publication of America’s largest veterans organization. It is her right to write such article but isn't right to lie to proud people who defended USA and other nations. 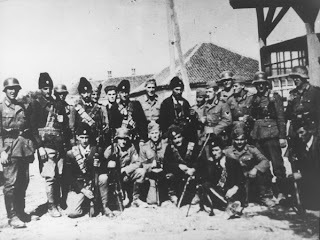 In her article she again put lie about chetnik's role in WW2 like they were on US side. Well placed lie about saving numerous US airman's by Draza Mihajlovic is simple fruit of her imagination. She even dare to advertise it by saying to her readers "FYI: Draza Mihailovic is mentioned." so they take special attention to that part of lie. 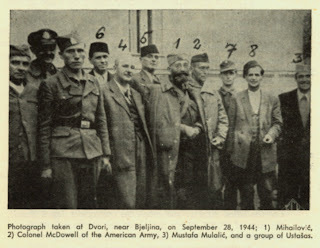 In the Ranger mission US Army Lt. Col. Robert H. McDowell "with the help of Lieutenant Nick Lalich" (NIKOLA LALIC, an American of Serbian heritage), gathered intelligence on Nazi troop movements and wrote a report on Draza's Chetniks movement. 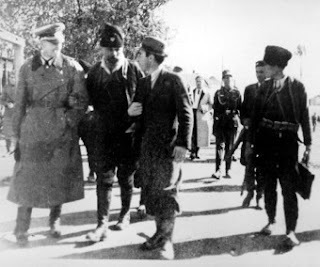 McDowell wrote that he "never saw any type of collaboration between Mihailovich and the Germans" and "did notice however how much Draza hated them." All I will comment is "Picture speak thousand words". 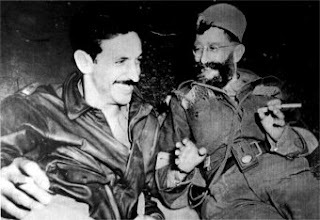 Serb-American Lieutenant Nick Lalich "( NIKOLA LALIC, an American of Serbian heritage)", with Draza Mihailovich. Photograph taken in September 1944 when Lalich "helped US Army Lt. Col. Robert H. McDowell"
Hence Julia Gorin's research is completely accurate and befitting the true events. Will you, or will you not "rememberize" that Draza Mihajlovic was decorated posthumously by president Truman in 1948. Is that also a "fabrication"? Any other "fabrications" or is this yet another CAIR attempt to discredit Julia Gorin? I think Draza was also awarded publicaly by presisent ronald Reagan . Eisenhower also said good things about the cheniks . If pictures dont lie did we see the poor muslim women holding her dead baby shot by a Serb sniper . only later to have her family of Serbs to recognize her as a Serb women ? why did we see bosnian muslims locked in Serb prisons only to find out the camera man was himself the only one standing behind a fence ? Draza has been vindicated from the cooked up communist charges he was convicted and exucuted for . Julia Gorin is one of the few leader in journalism that told the truth in Yugoslavia . She is right wing conservative becuase she is so anti communist , like so many other peole coming out of eastern europe . There are more communists in the United States ,France ,England and west Germany , Than their were in any of Yugoslavia's republics or Poland and Russia . In plain english the people that have had a chance to live under communist rule , dont want to try it again . This is not true about NAZIs Croatia is almost as nazi now as they ever were , so is Finland and the Baltic countries . The nazi's were defeated before evreybody found out how much they hated them . "why did we see bosnian muslims locked in Serb prisons only to find out the camera man was himself the only one standing behind a fence ?" If the Serbs were not American allies, who made this film?